The wooden bridge to the island of Enoshima (江ノ島桟橋) in Kanagawa Prefecture. 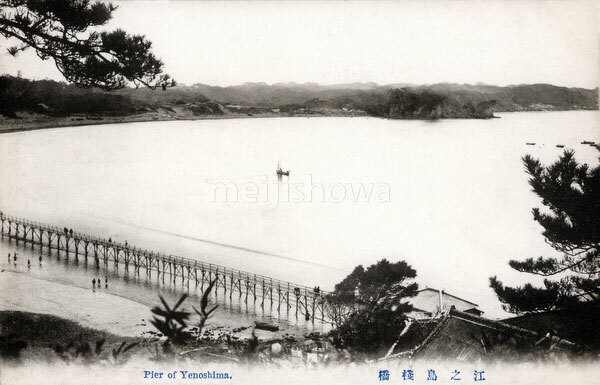 Enoshima’s first bridge was built in 1897 (Meiji 30). People were levied 3 sen in tolls to cross and return. In 1930 (Showa 5), Kanagawa Prefecture took over the bridge and lowered the toll to 2 sen. In 1949 (Showa 24), a new concrete bridge was built, the tolls were now 5 yen. This was changed to a ferro-concrete bridge in 1958 (Showa 33). In 1964 (Showa 39), the island was linked by a massive concrete bridge to accommodate modern traffic.